The most massive and famous star of this nebula is called Eta Carinae. This star is huge, more than 100 times more massive than our Sun. So massive, it can barely hold itself together. Sometimes it brightens, sometimes in fades, as it spews up energy from its surface. Some astronomers believe this star might explode into a supernova within our lifetime. The ultaviolet radiation from this star and its siblings, shredded the cloud into pieces, leaving a mess of tendrils and pillars. Within this nebula, lies a smaller nebula, called Homunculus Nebula. 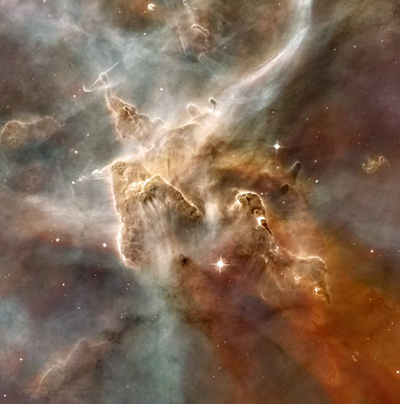 That region is believed to be ejected from the Carina Nebula in a violent outburst in 1841. The outburst made Eta Carinae the second brightest star in the sky, for a short time. Another portion of the Carina Nebula is called the Keyhole Nebula. That region is a small cloud of cold molecules and dust.